Introduction to French Artillery Fire Plan Equipment The "Deliberate Advance"
At the beginning of World War II, the French artillery system was based on the lessons they had learned in World War I. They refined the techniques learned in the "Great War" and their artillery tactics worked well when given the chance to function as intended. At the Battle of Gembloux, the French Artillery-Infantry defense stopped the German Blitzkrieg, allowing the French to hold their positions until they were outflanked to the South. The fact that the Germans were able to score a quick victory was not due to a deficiency in the artillery, although the battle of movement that occurred in 1940 often prevented the French artillery from being used to its maximum effectiveness. The mathematics and techniques of bringing indirect fire down on specific locations from separate battery positions had been worked out thoroughly in the 1914-1918 period and were used in some form by almost all nations at the beginning of WWII. Whenever the French moved to a new position, the first priority of the artillery was to establish a Fire Plan. In other places in the tutorial, we use the term fire plan to refer to a pre-game set of barrages and fire missions that will land on specific turns in the game. When considering French Artillery, the meaning is different. It means the integration of artillery assets into an overall control structure. Of course in a Battlefront games, the French can have preplanned fire missions as well, but when discussing the French artillery practices, we are using the more general meaning. Battery Positions be established and their positions relative to the FOs be determined precisely. Communications be established between the FOs and the firing assets. Rather than having the FOs connected with specific single batteries, as was often the German practice, the French added a twist by establishing the poste central du groupe which was a small headquarters subordinate to the commander of the artillery battalion. The poste central du groupe calculated the data necessary for firing all three batteries of a battalion at the same target and Battery commanders simply followed the instructions given them. The advantage of this system is that it allowed an artillery battalion to mass the fires of its batteries quickly on a single target. The disadvantage is that it took battery commanders out of the loop. In many ways the poste central du groupe has a similar function to the late-war U.S. Fire Direction Center (FDC), the primary difference being that the French system was still tied closely to the Forward Observer, and the flexibility of the U.S. map system and calculation aids had yet to be invented. If they had been allowed the time, the French Artillery might have evolved into a much more flexible system. In game terms, the effect of the French organization is that off-board artillery should almost always fire by battalion. The Moroccan division at the Battle of Gembloux had an artillery fire plan within 24 hours of occupying their positions in Belgium. This included registering some artillery battalions from an adjacent division that were allocated to support the Moroccans. 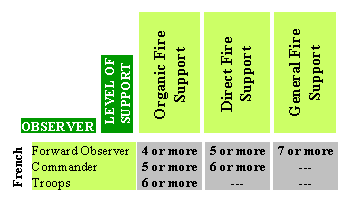 This indicates that a scenario designer can assume that a basic fire plan has been developed if the French have been in their positions for a day or more. The longer that the French occupied a position, the more sophisticated the fire plan is likely to be. More batteries were registered, and communications were improved. A scenario can specify that some battalion assets are part of the plan and others are not (and are therefore less effective). An extreme example of a fire plan is found in the main Maginot Line positions, where virtually every angle and position had been pre-plotted over the months of construction. Despite our modern contempt for these fortifications, it should be noted that in 1940 they were considered "state-of-the-art" and the Germans never made a serious attempt to force them by frontal attack. They had a lot of 75mm guns left in their arsenal. It was hard to convince politicians to allocate money for new artillery, especially while the bulk of the defence budget was now being allocated to the Maginot line. Also, much of the heavier artillery was procured during World War I and was of relatively recent design. Many of the Generals who had advocated the virtues of the 75mm gun were in positions of high responsibility. They were unconvinced that new artillery was needed. After all, they won WWI using this gun, it couldn't be all bad. In BF, each Battalion of 12 75mm guns places 6 Small templates with combat values of -1 vs V, 0 vs T, G, sV. In addition to the 75mm guns the French had some battalions of 105mm and 155mm artillery available. Divisions usually had 1 or 2 battalions of 155mm howitzers. Corps artillery had 2 battalions of 105mm guns and 2 battalions of 155mm howitzers. Divisional and corps artillery are usually only in general support as part of an integrated fire plan. The 12 tube (6 BF template) organization was maintained for the larger artillery. Their experiences in 1914-1918 had convinced the French High Command that mobile warfare was unlikely. Instead, they based their idea of an offensive on a plan called the "Deliberate Advance". This was designed to give a slow but extremely safe method of attacking, designed to maximize enemy casualties and minimize friendly casualties. Of course it also minimized the chance of rapidly winning the war. There was a common saying in vogue at the time that "The Artillery conquers, the Infantry occupies", and the Deliberate Advance certainly mirrored this theory. The basic idea of the DA was for friendly artillery to pulverize enemy front line positions and neutralize the enemy artillery, after which friendly troops would occupy their trenches. If this seems similar to what happened in World War I, it is not coincidental! Using infantry patrols, air reconnaissance, and sound-ranging equipment, the French would determine the German (the French had a pretty good idea of who they were going to be fighting :-) ) front line and artillery positions. Divisional and corps artillery assets would be brought forward and carefully sighted. A comprehensive fire plan would be developed designed to attain artillery supremacy. Prewar planning specified the extensive use of chemical weapons, and it is one of the few small mercies of WWII that they were not employed. The plan would be put into effect. After the artillery plan had smashed the enemy artillery and forward positions, the infantry, accompanied by tanks, would occupy the enemy positions. Tanks were never seen as a breakthrough weapon, but were designed to act as mobile artillery platforms to overcome local strongpoints that survived the initial artillery concentrations. After advancing 6-10km (the limit of the artillery support), the friendly forces would stop (ignoring that annoying Charles De Gaulle fellow screaming for them to continue on to Berlin), dig in and establish new trench lines and artillery positions. A new fire plan would be developed for the next stage of the advance. During the "phony war", the French used this a couple of times but then stopped (Poland had disappeared and there was no hurry). The basic defensive mindset of the French in 1939-40 meant that the Deliberate Advance was never really put to the test. While powerful in theory, it relied on its power upon a certain amount of cooperation from its opponent. If the enemy front-line trenches were heavily occupied and batteries fired from fixed positions, the DA could cause severe casualties. However, the build-up needed for a DA would be fairly easy to detect, and by deception operations the Germans could ensure that the massive blow would fall mainly on empty ground. They could then counterattack when the French attempted to consolidate. The French could see World War II coming, but spent much of their defense budget on concrete instead of tanks and mobile forces. In hindsight, the Maginot line was a waste of money, especially as it was not extended along the entire Northern frontier (for both political and budgetary reasons). The Germans simply went around the end of the fortification line. However, at the time, the idea of an impregnable shield on the border supported by mobile forces to the rear seemed to be sound doctrine. By the standards of 1939, the Maginot line WAS formidable, and the Germans did not really attempt a break-through. One of the features of the Maginot line was that almost every inch of ground around it was plotted for artillery support. It would have been very difficult to take by direct assault. When defending static positions, the fire plan should be comprehensive and well-developed. The key to defending in mobile situations is whether the French have been allowed time enough to register their artillery. As stated earlier, it took the French about 24 hours to establish a basic fire plan. Along with most nations during World War II, the French relied on wire communications between their forward positions and their firing assets. These were generally reliable, but could sometimes be broken up by shelling/bombing the rear areas. Command - High level*. When they were given the time to establish a fire plan, the French were able to allocate artillery from Corps and Division into their fire missions. The poste central du groupe allowed them to control all fire of the battalion from a relatively high level. This was one of the main differences between their artillery system and that of the Germans, where FOs were often tied to specific batteries. The fire plan would improve while the French occupied the same positions with more assets being tied into the plan. If they were not given time to establish a fire plan, their artillery was considerably less effective. Control - Medium. Dedicated Forward observers made most of the calls-for-fire for the artillery. Communications - Average. As long as they were using their established positions, they could expect relatively good communications. They were not particularly flexible in the advance. If their FOs left their observation posts, their communications would become less reliable until they had the opportunity to string new wire. For Battlefront, the scenario designer must decide if a fire plan exists and which assets are integrated into the plan. It is possible to have both fire plan and non-fire plan assets available in a scenario. The French use the call-for-fire table to the right. Also, if a fire mission is called by a forward observer who has not moved from his initial position, and consists of battalions that are part of a fire plan, apply the pre-registered modifier to the call-for-fire roll. Once a fire plan has been established, French Off-board Artillery may only fire by Battalion. However, it may always use ALL of the guns in the battalion (6 templates for the typical 75mm battalion). The French are NOT limited to fire by a single battery when firing a shelling pattern by a battalion that is part of a fire plan. For a typical 12 gun (6 template) battalion, they may arrange them either as a linear (6 wide, 1 deep) or rectangular (3 wide, 2 deep) pattern. The full battalion shelling pattern is the French "special" mission. To the right are the typical shelling patterns fired by 75mm battalion, where the basic IDF fire strength is -1 vs V and 0 vs T,G,sV. Concentration and thickened concentration fire missions may only be used by battalions that are part of a fire plan. Once again, the entire 12 gun battalion is used as a unit. To the right are the possible concentration patterns fired by a 12 gun 75mm battalion. 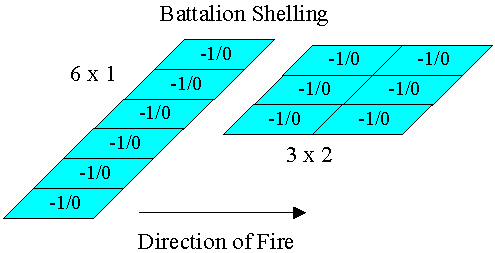 When firing mixed/smoke patterns by battalion, halve the number of templates in the regular pattern. General Support Artillery is available only if there is a fire plan and may fire only in conjunction with battalions that are part of a fire plan. Battalions that are part of a fire plan cannot be combined with those which are not in the plan within the same fire mission. For battalions which are NOT part of the fire plan, only shelling, smoke, and mixed shelling/smoke fire missions may be fired. Also, no pre-registration bonus is used on the call-for-fire table. However, the types of missions that can be fired depend on how far along the fire plan has progressed. Mark Hayes thought that they always would fire by battalion, as this is their basic doctrine and training. He recommended that they immediately be allowed to use the 3x2 shelling pattern above (or a 3x1 with mixed shelling/smoke). My (your not-so-humble webmaster's) feeling is to be somewhat more restrictive, especially at the early stages of the fire plan, because if the batteries were not located in the same geographic area (and they often dispersed to make them more difficult counter-battery targets), they would not be able to coordinate battalion fire. I would consider limiting them to the almost useless single battery pattern to the right at the beginning of the plan preparation (more to reflect the difficulty of coordinating fire than any specific doctrine) and have them work up to different battalion shelling patterns without pre-registration if they have been in place for a few hours. In any case, the referee should specify the patterns they can use and it would be perfectly reasonable to allow them to use more effective patterns as the game progresses. If anyone has any more definite knowledge of how they developed their plan, let us know and we will incorporate it into this tutorial. It should be noted that the French really did not expect to fight without a plan, as they anticipated battles to develop at a slower pace. Indeed, our sources almost exclusively describe the French doctrine assuming that the plan has been established. 75mm batteries can be placed on-board at the start of the game as determined by the scenario designer (they were sometimes brought forward to augment the antitank defenses). This would be the only on-board FS element for the French in the game other than organic mortars. While the early-war British artillery was not the flexible, deadly tool of 1944, it still was effective when used properly. Although most of the tactical doctrine remained the same throughout the war, and indeed the procedures at artillery brigade (regiment) level had been established and practiced since around 1930, above that level they were almost non-existent until late-1942, when the system described in our British Artillery Page was developed and promulgated as official doctrine. Also, while in France the BEF had spent months in static positions using line communications. When the invasion started there was insufficient user experience in the use of wireless (which had been little used during the 'phony war' for security reasons) and the environment of withdrawal and rapid defence gave the British insufficient time to put down comprehensive line networks and coordinate defensive fire. On the other hand the campaign in East Africa was exemplary and the artillery well handled in both defensive and offensive operations. After Dunkirk (where they were forced to abandon large amounts of equipment) and up through 1942, the British suffered more from a lack of artillery than any problems in doctrine. They were often forced to use 2-battery regiments (instead of the more effective 3-battery regiments). In the BEF period, the standard Field Regiment was organized into 2x12 gun (6 template) batteries and the troop size was 4 guns (2 templates). The battery patterns for a Field Regiment in the BEF period were 3 wide x 2 deep shelling pattern or a 3 wide x 1 deep concentration. 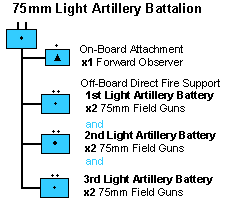 Note that there were only 2 batteries in a 1940 Field Artillery Regiment and this did not mesh well with the three Battalions in the Infantry Regiment that an FA regiment was usually assigned to support. Part of the reorganization that occurred after Dunkirk was the reallocation of the same 24 guns into 3 8-gun batteries. Each battery could then support a battalion. When engaging targets of opportunity, do not allow the British to use MIKE, UNCLE, and higher level concentrations until after Alamein. For an early war Field Regiment, the other batteries in the regiment can thicken the 3x1 concentration as General Support. In 1940 Northern France, the British should use the French Call-for-Fire numbers, and the scenario may call for additional negative modifiers to simulate poor communications. The German methods did not change as much during the war (see the German Artillery tutorial, and scenario artillery introduction). In tactical situations, the Germans did not centralize the control of their artillery assets as their own theorist (Bruchmüller) had advocated. 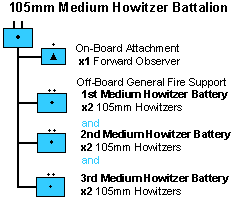 They tended to give more control to the lower level Forward Observers/Battery Commanders rather than allocating fire missions from centralized HQs. While they were fairly flexible in their allocation of Fire Support assets to various task groups (this would show up in pre-game fire plans), they tended not to combine them all at a tactical level (on-call fires). Later in the war they tried out a centralized artillery division on the Eastern Front. It was effective but soon was swept up in the Russian flood. Use the standard German artillery rules for the early war period. Most of the "minor" (with apologies to our Italian friends) countries in Europe, with the exception of the Finns, used an artillery doctrine that could trace its roots directly to WWI and probably did not evolve much during the course of the war. While specific information is hard to come by except for the major nations, the comments in this section can probably apply to Italy, Romania, Hungary, Poland, and any other of the smaller nations of Europe without being too far off. Essentially, this doctrine resembles French doctrine, with its emphasis on pre-planned fire and central control, but would lack the flexibility given to the French by the poste central du groupe. It also has some of the limitations of Russian doctrine. Pre-planned fire would be about the same as everyone else (most of this was derived from WWI), but ad hoc fires are more limited. Use the French Call-for-Fire table. 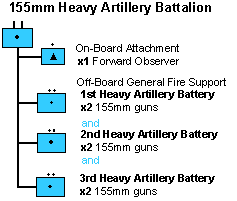 Artillery Battalions should be designated to support specific infantry regiments. Forward Observers can control specific Artillery Battalion organizations. Any call for a mission outside of the assigned assets should be treated as General support. Note that when using the French Call-for-Fire table, only FOs can call for general support. The Italians had more FOs available. Allow Italian Battalion HQs and Regimental HQs to call-for-fire, in addition to designated FOs. For other nations, allow only the Regimental HQs and FOs to call for fire. Don't allow ad hoc concentrations except from pre-established Observation positions (the Russians already have this restriction in the rulebook). Limit shelling missions to a single battery (unlike the French). In many ways similar to the French, the Belgians were even more tied to the fortress mentality. During the inter-war period, the Finns developed a sophisticated artillery doctrine. However, they were hampered by a severe ammunition shortage that never let them use their doctrine to its full potential, and during the Winter War they suffered somewhat from a lack of trained observers. See the Finnish OOB ZIP format or PDF Format for more specific Finnish Artillery organizations. Essentially the Finns use the French methods, including Battalion shelling, and are always considered to have a fire plan in effect. During the continuation War, the Finns rectified their observer shortage so every Battalion and higher HQ stand can use the Forward Observer line of the Call-for-Fire table. During the Winter War, only designated FOs can use this line. ON ARTILLERY by Bruce Gudmundsson. Nigel Evans' awesome Royal Artillery page. Axis and Allies on the Ostfront by Bob Mackenzie (available from Brookhurst).